Average Height	: 16" - 17"
An ancient breed, the Pulik crossed the plains into Hungary with the Magyars several thousand years ago where they were used as sheep dogs. Many shepherds seemed to prefer black dogs, but this was probably because they are easier to see among the flock. The Puli was the herding and droving dog, prized for its light, agile movement while the larger Hungarian breed, the Komondor, was more often used as a guarding dog for the flocks. At the time of the second world war, the breed had almost died out and its numbers were reduced to two figures. But a controlled breeding program assisted by dedicated breeders around the world ensured the survival of these unique little Hungarians. •	Lively, cheerful little dog, loyal. •	Excellent family pet, but not with small children who may tease them. •	Adapts well to most surroundings and circumstances. •	Intelligent, easy to train. •	If not established as the 'master', this breed will quickly become alpha and willful, with a mind of it's own. •	Love obedience and agility, and the show ring. •	Wary of strangers, but not aggressive. •	A hardy, healthy breed. •	Moderate daily exercise is good. •	Love to romp and play. •	Some, not all, are fond of water and are good swimmers [be sure their coat doesn't drag them down]. •	Great choice for those with allergies. They do not shed like most other breeds. Many families and single people are looking for a dog that can join in and become a part of the family. The Puli is a breed that can fit that bill perfectly. In general, the Puli is a chipper and lively breed that enjoys being with its owner and the members of the family. When treated properly and cared for properly the Puli will become a very loyal member of the family. This breed may be small in size but they are big in joyful expressions of love. Puli's are an excellent choice as a family pet. The Puli adapts to almost all surroundings and circumstances easily. Puli's are very intelligent and that is a bonus when it comes to training. However, this same intelligence can give them a sense of independence in that they often have a mind of their own. It is this same level of intelligence that allows them to do well in obedience training and gives them the agility they need for the show ring. They are known to be stand offish with strangers but are rarely aggressive. They may, however, bark when they feel their owner is being threatened. Families with very small children may want to wait a while before bringing a Puli into the family. They are not recommended for small children who may tease or be rough with them. However, if they are raised with a child from puppy age, they can do just fine with the kids. The Puli is generally robust and healthy. It is very important to understand that this breed should not be brushed. The corded coat of the animal begins to form at around the age of 6 months when the soft woolly undercoat intermingles with the harsher outer-coat. At this point, the mats that have formed should be separated by hand. This should be done on a regular basis. The clumps should be separated by hand from the tip of the clump back to the skin. It should be noted that each coat is individual to the animal but as a rough guide, the sections should not be made thinner than the width of a pencil. Learning this may take a bit of time and practice but the animal itself often finds this hand care to be relaxing and will not usually complain. Once you have learned the technique for this the care is quick and easy. Bathing the Puli is much like washing a sweater. The time consuming part of bathing is with the drying of the animal. You can use an electric dryer as long as the heat setting is monitored. Even with the dryer this can take a long time, up to two hours. However, if left to air dry the animal can remain wet for up to two days. While the Puli may be calm and peaceful animals they are, nonetheless, a breed that enjoys activities. When they are healthy they are energetic and lively and they love to play. Many love to swim, but it should be noted that not all Pulik are good at swimming and they should not be allowed to go into the water unsupervised. In general they are a medium level breed as far as exercise is concerned. They love to be walked and can walk a good distance before tiring. When being walked they should be on a leash as they may decide to run off to explore something they see. 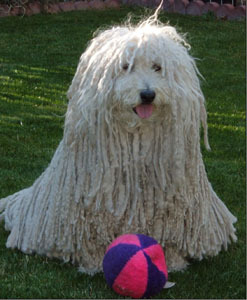 If you have an enclosed yard your Puli will often exercise themselvers with play and running. They will happily play with their owners and with other dogs who are a part of the family or with whom they are familiar. Generally, an exercise period of 30 minutes or so will suffice to keep your Puli healthy and in shape. The breed's high level of intelligence allows owners to set up small training courses for the animal as well. These can be simple running and jumping items or they can be more advanced. There are many breeds that take well to training and of these the Puli is one of the best. This breed has long been used as a working herd animal and that long history of working has made the animal very receptive to training. It is truly up the owner to decide the level of training that is needed. For most owners, simple obedience training can be performed at home and by the owner. This includes many of the routine issues such as housebreaking and breaking bad behavior patterns. Other owners may wish a more advanced level of training for the animal. One reason for this is that the Puli is a good show breed. With more advanced training the Puli can become very impressive and is often regarded as one of the most "trainable" breeds around. Then there are the owners who wish to have something in-between. For many owners this is the best of both worlds. This type of training is best conducted by a professional trainer who can get the training started with the animal and then hand over the training to the owner. Because of the high level of intelligence that this breed has most owners will find training easy and fun. It is advisable, however, to not "push" the animal too hard or too fast. As mentioned above, the Puli can be stubborn and independent at times, but this makes the animal even more enjoyable. If you decide to train your Puli yourself, you get valuable information online concerning what works best and what does not work very well.